Topeak's entry into the admittedly not very crowded trailer market looks good but doesn't quite have the versatility of a Bob Yak. At first glance the Journey is a very classy looking beast. Hefty looking aluminium tubing builds into a solid platform with a huge and very smart black and yellow drybag nestling on the deck. It's a classic single wheeler and the closest reference point is inevitably going to be the venerable, but much loved, Bob Yak. 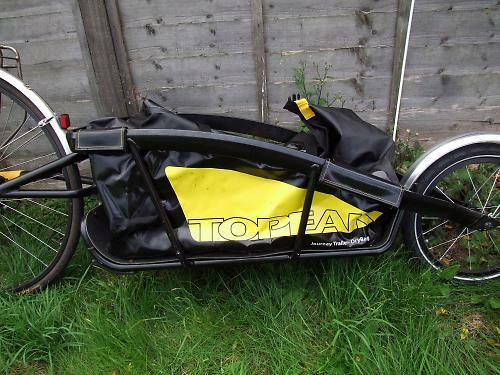 Topeak claim that their trailer is 'perfect for a ride to the market or a trip across a continent'. Ok, I'll be honest, I haven't actually taken it anywhere more exotic than the local Sainsburys but that's where it really belongs. What Topeak have done here is to take a rough, tough original concept (the Bob Yak) and smooth off the edges to make it more pleasing to a less gnarly target market. If the Yak is a muddy Land Rover living on a farm, the Journey is a Discovery living in a suburban driveway. That isn't necessarily a bad thing, not everyone wants ruffty-tuffty malleability in their urban transport solutions. It's a trailer for people who want something simple and off the peg, it's not for hardened bike geeks. 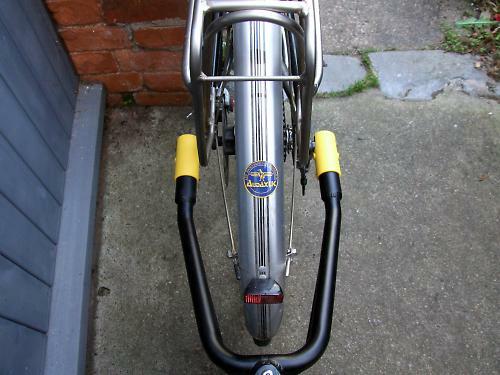 If you want a clear example of where Topeak have gentrified and smartened up the basic design, take a look at the hitch. Readers of a certain age will remember the apocryphal story that when America decided to send men into space, they spent millions of dollars designing a space pen that could write in zero gravity. The Russians spent bugger all and went into space armed with pencils. Topeak have opted for the space pen approach. The hitch consists of a replacement QR with two stubs that sit outside the dropouts. They look a bit like very short grind pegs. You pull back both spring loaded yellow collars on the hitch arms and twist to lock them in position. This exposes a notch on each arm of the hitch which you then drop over the stubs. That done you twist the collars to release them and they slide forward to lock everything in position. It's very secure, there is no chance of the hitch bouncing loose and the collars are simple to operate. That said, the Bob makes do with a simple hook on each arm which drops over an extended QR and locks in place with a split-pin. Space biro vs space pencil... Probably a dead heat in terms of how easy they are to use, but if you're trekking across continents, simple is usually the way to go. Not such a big deal when you're popping over to Waitrose for a big pack of loo roll and some expensive bread. The Journey QR is also much bulkier than the Yak's, which meant that a planned trailer swap with a friend didn't happen because the stubs fouled on his rack mount. If you're not sure whether the Journey will fit your bike, see if you can try one before buying or buy from somewhere with a good returns policy. As a load hauler the Journey is very competent. It's not that heavy, although ours did weigh in at 7.5kg for chassis and bag, over a kilo more than Topeak's stated weight of 6.45kg. Unloaded it's barely noticeable, meekly trundling along behind the bike like an obedient dog. Once you've loaded up though (remembering to keep heavy stuff as close to the bike end as possible) it turns into a dog with a very waggy tail. On the flat is fine, honking up hills is tricky and best avoided and going downhill at much over 20mph can be very dicey indeed. Being a single wheeler means the trailer tracks beautifully behind the bike, unlike two wheelers which can be reluctant to steer and are much wider. However, at speed the simple fact that you've stuck a great big heavy thing out the back of your bike means that speed wobble is inevitable. It comes on quite predictably and usually you can feel it starting to build, which gives you ample time to slow down and correct, but long descents can be a hairy challenge. On a recent apple scrumping trip I ended up with about 40 kilos of fruity goodness, which is admittedly a fair bit over the stated weight limit of 32kg. Mostly the Journey behaved itself but there were a few moments where I wondered if I was going to be able to slow down quickly enough before the trailer whipped me into a hedge. By the time I got home my disc brakes were hot enough to fry eggs and I was ready for a stiff gin. This is pretty much a design feature of single wheelers, unfortunately, so you have to learn to live with it. So, the drybag is excellent, it can handle a big shop (and almost five gallons worth of cider apples) and it looks cool. What's not to like? Well, the price seems pretty steep, it's well into 'you could get a decent frame for that' territory but it's not noticeably more expensive than most other trailers. The Bob Yak is about £250 without a drybag and over £350 with. The other thing that annoys somewhat is the huge tubing, which doesn't give nice grab points for bungee cords or mounting points for lights. You can fit a light, but only on the (Topeak specific) mudguard mount. These may seem like small niggles but they do underline that you get to use the trailer the way Topeak dictate, unlike the Bob, which offers a more adaptable blank canvas. Oh and as the Journey is aluminium, if it breaks on a grand world tour you'll be shopping for a replacement rather than watching a third world blacksmith weld you a great dinner party anecdote. 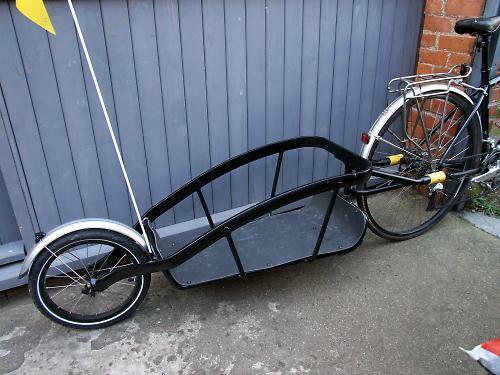 At the end of the day the Journey may be the Bob's polite and slightly effete cousin but the more people decide to do their shopping by bike, the better the world becomes and if they need a prettier trailer then so be it. Robust and well made trailer - probably better for urban shoppers who want an off-the-peg cargo solution rather than hardened bike geeks who want to do things their way. Topeak blurb - "This modern trailer and drybag combo is perfect for a ride to the market or a trip across a continent. Featuring an elegant TwinSpar frame, the lightweight yet rugged alloy design handles any touring load with predictable and stable road manners. SlideLock quick release fittings allow the rider to attach or remove the trailer easily, or with an extra optional fitting, install the trailer on a second bike. A custom waterproof drybag fits securely into the trailer and can double as stand alone luggage. Fits on bikes with rear dropout spacing of 130 mm or 135 mm with 26' or 700c wheels." Not sure about taking it on rough roads abroad, but it should last you a lifetime of urban shopping. Heavier than stated, but once loaded up a bonus kilogram isn't going to make much difference. If we assume that comfort equates to handling then it's perfectly fine until you load it up. Once you get close to the weight limit then the handling gets progressively more tricksy. This isn't exactly news for a single wheel trailer, but it can take a while before you get the hang of it. It feels like a lot of money for a few tubes and a wheel but other trailers are in the same ballpark. Build quality is very good and the drybag is excellent. Pretty good. It will cope with a weekly shop or a great big load of apples equally well. Neat looks, excellent dry-sack. Hitch is pleasing if somewhat over-engineered. Hard to attach accessories. High speed handling is pretty scary but that's not specific to this trailer. Smart urban trailer, if a little too refined to be a true round-the-world contender. Once you've loaded up though (remembering to keep heavy stuff as close to the bike end as possible) it turns into a dog with a very waggy tail. I had been using a cheep single-wheeled trailer (you know the ones) for about 3 years and have recently upgraded to a Bob yak. Although logic seemed to sugest the bike end was the best place for heaver items I soon learned that this gives the trailer an increased tendency to jack-knife and much less stability. I would strongly suggest putting the weight as far back as possible I think you'll find it improves things. The trailer body flares out slightly towards the bike end, giving more space, which would suggest that the weight ought be at that end. Might have a go loading it as you suggest and see if that makes a difference.